Jorge Arias (born August 5, 1977) is a Mexican American professional wrestler. He currently works for the WWE. He is currently portraying the Sin Cara character. He was formerly known by the ring name Hunico. Before working with WWE, Arias was better known under the ring name Incognito. He mainly worked for the Asistencia Asesoría y Administración (AAA) in Mexico and Chikara in the United States. 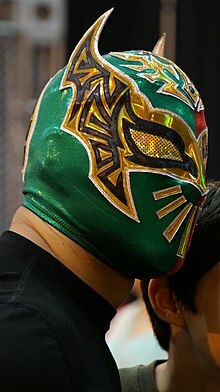 Arias first wrestled under the name "Místico"
Incognito is perhaps best known in the USA for being a member of Team Mexico along with Puma, Magno, and Shocker during Total Nonstop Action Wrestling's 2006 World X-Cup Tournament. Team Mexico finished in 3rd place with Team USA in 1st place, Team Canada in 2nd place, and Team Japan in last place. As well as his career in Mexico working for AAA, he is also known for competing in Chikara, where he won both the 2008 King of Trios (alongside El Pantera and Lince Dorado) and the 2008 Rey de Voladores tournament. PWI ranked him # 328 of the 500 best singles wrestlers in the PWI 500 in 2008. ↑ 1.00 1.01 1.02 1.03 1.04 1.05 1.06 1.07 1.08 1.09 1.10 1.11 "Hunico". Online World of Wrestling. Retrieved 2011-08-10. ↑ 2.0 2.1 2.2 2.3 "Hunico". WWE. Retrieved 2011-10-28. ↑ Cupach, Mike (2011-11-19). "Cupach's WWE SmackDown report 11/18: Alt. perspective review of final WWE TV before Survivor Series, Mike's Reax to #overallshow". Pro Wrestling Torch. Retrieved 2011-11-26. ↑ 5.0 5.1 5.2 5.3 5.4 Namako, Jason. "Superstars Results - 3/15/12". Wrestleview. Retrieved 17 March 2012. ↑ Namako, Jason (2011-12-16). "Superstars Results - 12/15/11". Wrestleview. Retrieved 2011-12-24. ↑ "Hunico". Florida Championship Wrestling. Retrieved 2010-12-31. ↑ Parks, Greg (2011-09-23). "Parks' WWE SmackDown report 9/23: Ongoing "virtual time" coverage of the show, including Mark Henry's first Smackdown as World Champion". Pro Wrestling Torch. Retrieved 2011-10-01. ↑ Parks, Greg (2011-08-31). "Parks' WWE SmackDown report 8/30: Complete coverage of the Friday night show, including Orton vs. Christian for the World Title in a Steel Cage". Pro Wrestling Torch. Retrieved 2011-08-31. ↑ Cupach, Michael (2011-08-27). "Cupach's WWE SmackDown report 8/26: Alt. perspective review, Mike's Reax to segment & matches". Pro Wrestling Torch. Retrieved 2011-08-30. ↑ 12.0 12.1 12.2 Namako, Jason (2011-05-10). "Superstars Results - 5/10/12". Wrestleview. Retrieved 2012-06-09. ↑ Namako, Jason (2011-11-16). "Superstars Results - 12/15/11". Wrestleview. Retrieved 2012-06-09. ↑ Trionfo, Richard. "WWE SUPERSTARS REPORT: HUNICO/GABRIEL; DIVAS IN ACTION; RILEY/MAHAL". PWInsider. Retrieved 2012-07-14. ↑ Namako, Jason (2012-06-08). "WWE Superstars report: Ryder/Swagger; Mahal/Riley; Hunico/Yoshi Tatsu". PWInsider. Retrieved 2012-06-09. Hunico with a kick and he hits a Tiger Driver for a near fall. ↑ Tedesco, Mike (2011-11-12). "Smackdown Results - 11/11/11". Wrestleview. Retrieved 2011-12-24. ↑ Tedesco, Mike (2011-11-26). "Smackdown Results - 11/25/11". Wrestleview. Retrieved 2011-12-24. ↑ "RESULTS". Chikarapro.com. Retrieved 2009-01-09. ↑ "Rey de Voladores 2008". Chikarafans.com. Retrieved 2009-01-12. ↑ "World Wrestling Association World Middleweight Title". wrestling-titles.com. Retrieved 2009-01-12. ↑ "PWI 500 2008". wwe-zone.com. Retrieved 2009-01-12.